Report: North Korea's Satellite May Be 'Tumbling Out Of Control' : The Two-Way NBC News reports that U.S. officials tracking the object warn it isn't orbiting normally. South Korea's defense ministry says it may be a couple more weeks before it's known for sure if the satellite is circling the planet safely. There are conflicting reports about whether the satellite launched into space Wednesday from North Korea is safely circling the planet. South Korea's Yonhap News Agency writes that South Korea's defense ministry says the object is in orbit, but adds that "it was not yet known whether it was functioning properly." NBC News says it has been told by "U.S. officials" that the satellite appears to be is "tumbling out of control." The network adds that "the officials said that it is indeed some kind of space vehicle, but they still haven't been able to determine exactly what the satellite is supposed to do." An out-of-control object could pose a danger to those of us on the ground, of course. It could also cause problems for other objects in space. In February 2009, two large communications satellites collided over Siberia, "spewing out clouds of space junk," as NPR's Nell Greenfieldboyce reported. As for the launch itself, The Associated Press writes that "the U.N. Security Council said in a brief statement after closed consultations Wednesday that the launch violates council resolutions against the North's use of ballistic missile technology, and said it would urgently consider 'an appropriate response.' 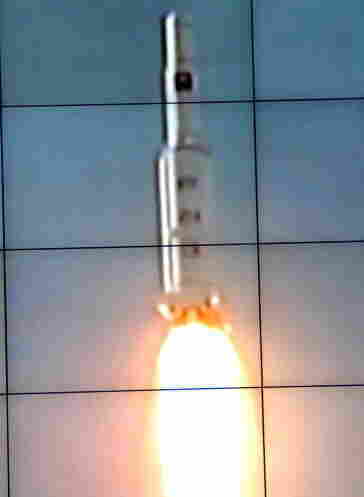 "
Another related post: "What North Korea's Rocket Launch Means — And What It Doesn't." N2YO.com has put a "real time satellite tracking" graphic up that aims to keep an eye on where the object is.